Hard to imagine that Matthew McConaughey once headlined spoon-fed bullcrap like How To Lose A Guy In 10 Days and Failure To Launch, isn’t it? Now, the Texan actor has rocketed into the stratosphere with acclaimed performances in high-calibre films such as The Lincoln Lawyer, Mud, Killer Joe and The Wolf of Wall Street. But here, with Dallas Buyers Club, comes the mountain peak of the so-dubbed “McConnaissance”. Everything you may have heard about McConaughey’s performance as homophobic redneck turned unlikely pharmaceutical hero Ron Woodroof is true. It is one of great passion, layered sensitivity, and unabashed selflessness – and that’s not even going past his dramatic weight loss to play the role. Brutal in his display of Woodroof’s raging intolerance but miraculously remaining his charisma and shockingly likable personality, McConaughey fires from all cylinders here and never once missing his target. He is a revelation in the role, pure and simple. 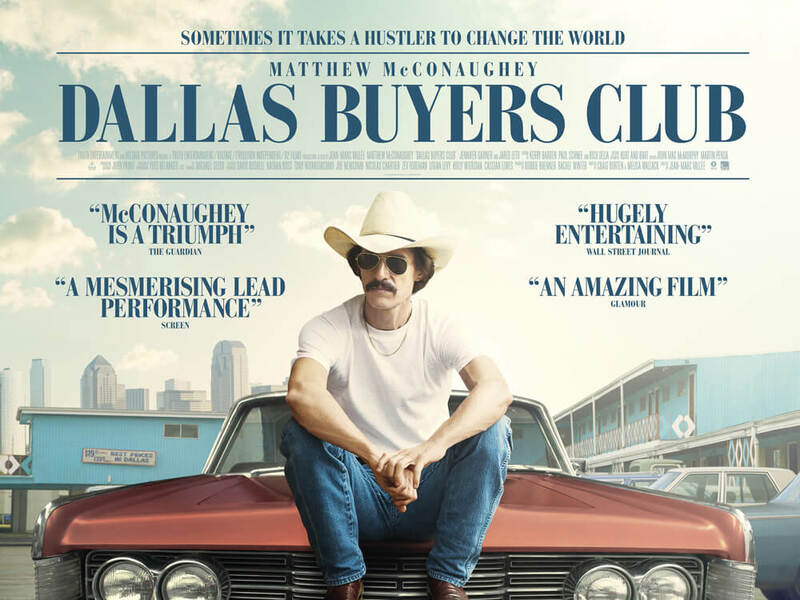 But taking McConaughey out of it, how does the rest of Dallas Buyers Club hold up? Thankfully, it remains an engaging and emotional film to watch, thanks to Jean-Marc Vallée’s focused direction and the witty original screenplay by Craig Borten and Melisa Wallack. The latter pair tackles a heavy subject that would be difficult for anyone to pull off but they keep finding new ways of holding our attention with its strong-hearted characters and unexpected moments of hilarity. The other key performance worth talking about is Jared Leto as transsexual AIDS patient Rayon. In another actor’s hands, the character could have easily been a camped-up stereotype but Leto does something truly magnificent here in giving Rayon a living, breathing soul to lighten up the film whenever she shows up. Far from being comic relief, Leto carries some of the film’s most gut-wrenching scenes to a tee. A fairly-late scene sees Rayon – real name Raymond – visiting his distant father wearing a normal suit and feigning his drag disguise. It is extremely jarring to see him look like this after scene after scene of him having the time of his life wearing dresses and wigs as Rayon. Almost immediately you sense he is out of his comfort zone and watching him nearly break down in front of his father is heart-breaking acting by Leto. Jennifer Garner, the other main lead, isn’t given nearly as much to do as McConaughey and Leto in order for her to stand out, but she does well with what she is given and provides the audience with a balanced look into the pharmaceutical bureaucracy and its snobbish treatment towards the HIV/AIDS virus. Steve Zahn, in an even smaller role as a friendly police officer, makes the most of his few scenes to establish a likable presence as well. If there was a gripe to be made against the film, the way it portrays said medicinal bureaucracy seems to be largely in favour of the clichéd “big bad establishment” motif which makes them an easy target for antagonism. Remember the disapproving doctors from that terrible Patch Adams movie? Not as over-the-top or hackneyed as that, but their bullying methods are distracting and doesn’t always make for a fair look at the treatment of the disease at the time. Nonetheless, Dallas Buyers Club is a well-made drama which should be an essential watch in the ongoing drama of “McConaissance”. Dallas Buyers Club tells a fascinating story through its direction and writing, but what makes it ride the waves is the central performances of Matthew McConaughey and Jared Leto who both deserve each and every award they continue to come across.